Members of this year’s incoming Fordham LL.M. class have sprinted in Olympic trials, litigated high-value cases before international courts, and volunteered on a presidential campaign. Amid their varying, successful life experiences, they all recently made the same decision: to attend Fordham Law to further their legal careers. The LL.M. program’s strength revealed itself in the first week of classes, said new student Lucy Onyeforo, who competed in the 100-meter dash at the 2008 and 2012 U.K. Olympic trials. She is studying international dispute resolution. 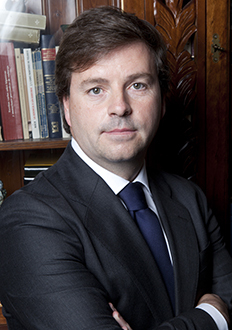 Since founding Madrid-based JLG Abogados in January 2012, Luis Divar has represented numerous clients in high-dollar international litigation and arbitration proceedings. Most notably, he represented the European Communities Commission before the National Appellate Court of Spain in a “milk fraud” case valued at 200 million euros. This fall, Divar’s work with his firm continues but with new challenges attached. He wakes at 3 a.m. some days, in order to participate in conference calls six hours ahead in Madrid, and sends his partners writs so that they can argue them in court while he is away attending Fordham Law School. “For me, it’s very important to maintain my firm and my clients,” Divar said. Divar would eventually like to become a partner in an American law firm. To achieve this goal, he learned, after meeting with several firms, that he would need to earn an LL.M. and then pass the New York bar. Latin American law is rooted in the same civil code as Spanish law, making him a potential asset to firms looking to connect with Spanish-speaking clients. Fordham’s Jesuit identity attracted Divar during his search for a suitable LL.M. program. His three children, he noted, had attended Jesuit schools in Madrid. The Law School’s excellent reputation among his peers in New York sealed his decision. Studying international dispute resolution provides Divar an opportunity to develop a stronger base in American arbitration. Yet, the switch from civil law to common law, and its focus on applying legal rules to develop a case, presents its own difficulties for him. In her first month at Fordham Law, Lucy Onyeforo has been running from one activity to the next: from her dispute resolution classes to her work as a research assistant with Professor Jacqueline Nolan-Haley, from the library to the annual symposium organized by the Fordham Intellectual Property, Media and Entertainment Law Journal (for which she’s a staff member). But Onyeforo, after all, is used to running—very, very fast. Onyeforo is a sprinting super star. In 2008 and 2012, she ran in the Olympic trials in the 100-meter for her home country of the United Kingdom, and she did this all while holding down a serious legal job with Freshfields, one of the UK’s five leading law firms. “I’ve always had two passions: sport and the law. In my adult life, I’ve been fortunate to be able to pursue them both,” she said. For nearly five years, Onyeforo trained as a sprinter with Olympic gold medalist Linford Christie’s team in the morning and early afternoon, before finishing off her day at Freshfields reviewing and editing legal documents and conducting legal research. 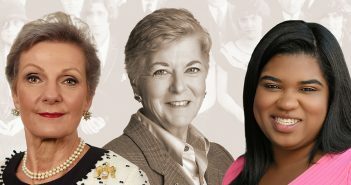 She particularly enjoyed her dispute resolution work because it provided her exposure to a wide range of cases. She worked on, for example, the London Interbank Offered Rate (LIBOR) case in the aftermath of the 2008 economic collapse, Michael Jackson v. Sheikh of Bahrain, and Apple v. Samsung, a copyright dispute. When a hamstring injury sustained just before the London games in 2012 curtailed her Olympic sprinting aspirations, Onyeforo shrugged it off—and picked up a new athletic endeavor: bobsledding. To say that she quickly took to the sport is an understatement. In addition to medalling at the 2013 America’s Cup final in Lake Placid, Onyeforo joined the 2013 World Championship team in Switzerland as well as the 2015 World Championship in Germany. 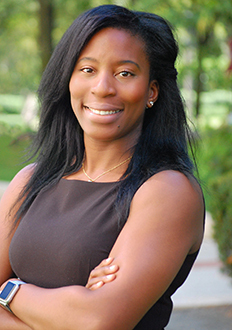 For Onyeforo, competing at a high level in sports and practicing law require the same types of skills. She intends to bring the same focus to Fordham Law as she studies international dispute resolution. While her Fordham classes started just weeks after the Rio Olympics ended, she has not at all surrendered her sporting love for her legal one. In fact, she has joined the local New York Sports Club, where she fields questions from strangers curious about her intense workout routine. Strangers also stop Onyeforo outside the gym every now and again when they recognize her as a star athlete—just not the one she actually is. If only these well-meaning admirers knew that Onyeforo has never played a tennis match in her life. If only they knew who they were really talking to: a woman who sprints through accomplishments with a speed that defies convention. Prior to starting classes this fall, Mari Tomunen practiced Fordham Law School’s motto, “In the service of others,” in a presidential context. Tomunen, a Finland native, called voters from dozens of states, informing them about numerous facets of Democratic presidential nominee Hillary Clinton’s campaign. She then attended the Democratic National Convention in Philadelphia, where she witnessed up close the strength of Clinton’s base. “Everybody in the whole world is watching what’s happening in this election, and it will have an impact everywhere,” Tomunen said. Tomunen moved to New York City one year ago, not long after finishing a five-year law degree in Helsinki, Finland’s capital and largest city. “That’s the dream of many lawyers in Europe: to be in New York and practice law here,” Tomunen said. During an internship last spring at a New York law firm, she encountered numerous Fordham alumni who gave her insight into the strength of the School’s LL.M. program. 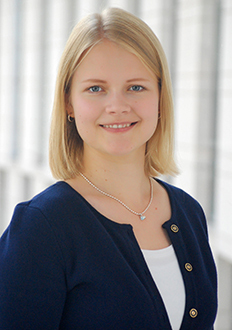 Tomunen followed their advice and is now focusing on corporate law with the intent of learning contract drafting, litigation management, and other skills American and Finnish clients require. A major part of her adjustment, she noted, is learning the source of legal differences between the two nations. She has noticed differences outside the law as well. “New Yorkers don’t cook for themselves,” she said. “The expense of everything here takes some getting used to, and there is a vast spectrum of rich and poor.” The importance and ease of networking, something she encountered on the Clinton campaign, also stands out as a difference between the two cultures. Clinton’s organization, her message, and her team’s awareness of their goals all resonated with Tomunen. So did the potential to play a role in the election of the first woman president in the United States.